Let’s cut the crap, and move to the big question. What are the best baseball cleats for pitchers? There are many big brands that manufacture baseball cleats, but if you’re a pitcher, then the normal cleats may not be the perfect option for you. Here, I’ll try my best to give you a clear idea of what type of cleats should be best for you. For baseball pitchers, I recommend New Balance L4040v3 Baseball Cleats. 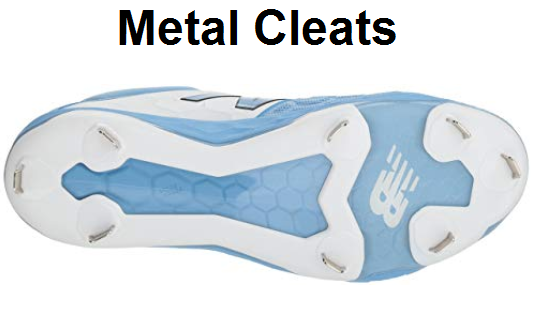 These are metal cleats, however, if you league doesn’t allow metal cleats, then you can go with molded cleats like New Balance 4040v4 Cleats. For turf ground, New Balance TY4040 Shoes are also a good option for you. You can read the whole for more options, but these are one of the best options you have. Whether you need low top cleats or high top cleats, it depends on how much ankle support you want. The high tops provide extra support to the ankles and help to give protection against ankle injuries, but it also restricts the ankle movements up to some extent. However, the low tops do not provide ankle support, but they are also lightweight that helps you to gain speed quickly. The mid tops offer moderate ankle support and they’re good for easy movements. For a baseball pitcher, choosing low top or high top cleats don’t affect their performance. If speed is more important to you, then low top or mid top cleats should be your choice. However, if you want ankle support, then go with high top cleats. The baseball cleats are made of synthetic leather and genuine leather. The cleats made of genuine leather are more breathable, durable and of superior quality as compared to the synthetic leather. But, these cleats are also much more expensive. Along with the features, you should take care of how much you can afford. For most of the young baseball players who play in little leagues or maybe in high school, inexpensive cleats made of synthetic leather should work fine. If you can afford some expensive baseball cleats, then it’s your choice. 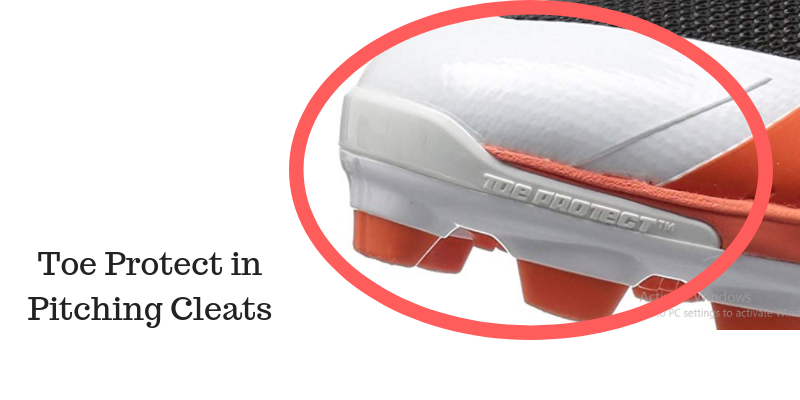 However, if you are a professional player or playing at such a level where your performance matters a lot, and you can’t afford a single element that can reduce your performance, in that case, genuine leather cleats is the best. When pitchers throw a pitch, they have a tendency to drag their toe through the dirt when they fall through the rotation. Therefore, to extend the life of your pitching cleats, you should prefer cleats with reinforced toe. The reinforced toe provides extra protection on the toe area of your cleats and helps them to last longer. Take a look at this short video (42 seconds long). Zack Greinke throwing a pitch, and it clearly shows why you need toe protection in your cleats. Focus on his feet. If you’re not comfortable in your cleats, then it’ll definitely affect your performance. Your cleats should be perfectly fit in your feet. When buying your pitcher’s shoes, make sure they have some wiggle room for your toes, and allow some movement. But, do not buy a large size just because you want some extra room for your toes. The gap between your toe and the end of the cleat should not more than ¼ inches. If you are confused between two sizes, then choose a little tight shoe instead of a loose one. As you wear them, you’ll break them in, and the cleats will expand and they’ll become comfortable. However, if you buy little too loose cleats, then they will stay uncomfortable whether you break them in or not. If you have flat feet or wide feet, then you need to take extra precautions while purchasing your pitching cleats. There is nothing worse than wearing uncomfortable shoes on the field that are not according to your feet. If you have flat feet or wide feet, then consider buying wide baseball cleats in which your feet will be comfortable. 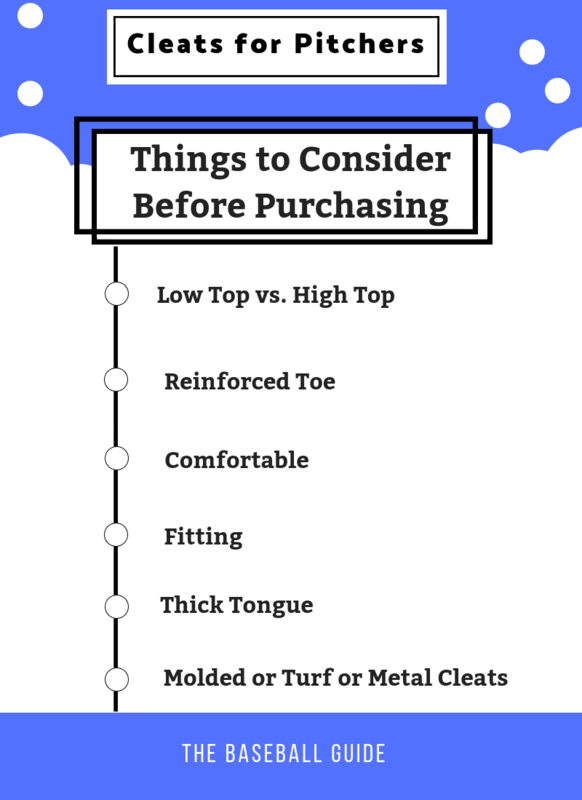 It is not a deal breaker, but having cleats with thick tongue makes them a little more comfortable, and it also stops the dirt from getting inside your cleats. Which type of baseball cleats you should buy depends on a few factors. Let’s discuss them. The metal cleats provide more traction and grip on the ground. 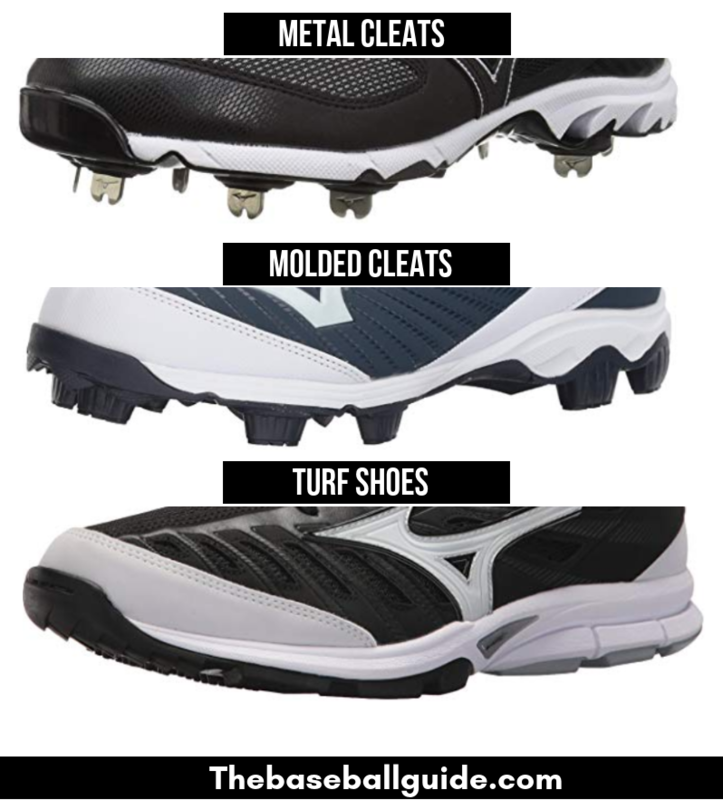 If you play on grass and dirt grounds, then metal cleats are perfect for you. 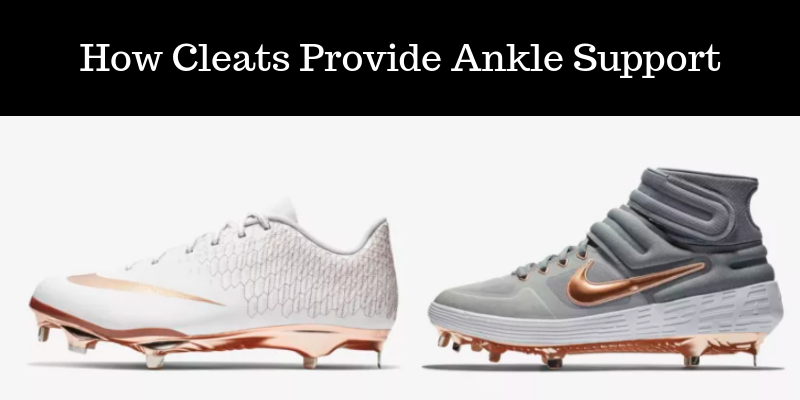 As the pitchers require more stability to throw an accurate pitch, therefore, buying metal cleats can be a good choice for pitchers whether they are in Baseball or Softball. Note: Before buying metal cleats, make sure your league allows them because many little leagues don’t allow players to wear metal cleats. 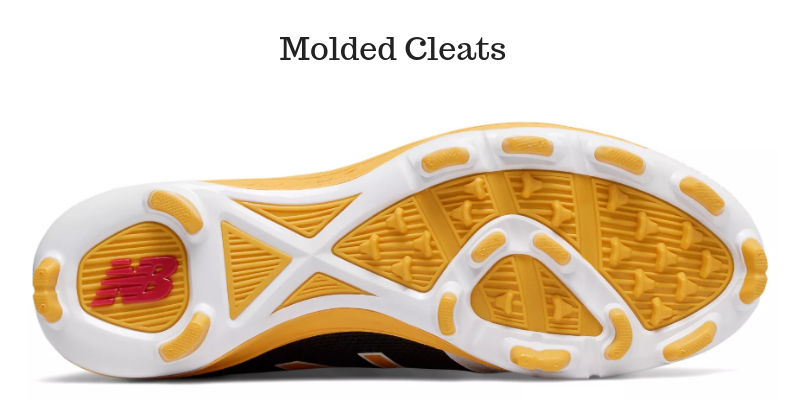 In case, your league doesn’t allow metal cleats or if you personally don’t like metal cleats, then molded cleats is the best alternative you have. They provide good traction and grip, and they are more suitable for soft grounds. If you play on the artificial turf ground, then you shouldn’t wear molded or metal cleats. In that case, you should go with the turf shoes. For pitchers, my number one choice is New Balance Baseball Cleats. The New Balance L3000v3 Cleats and New Balance L4040v4 Cleats are the two most popular cleats that are perfect for baseball players. If you prefer metal cleats, then there is nothing better than New Balance Men’s L3000v3 Metal Cleats. If you prefer molded cleats, then you should go with New Balance Men’s PL4040v4 Molded Shoes. If you like turf shoes, then the New Balance Men’s 3000v4 Turf Shoes are the best. But, why should you choose New Balance Cleats? In recent years, New Balance has manufactured some really awesome cleats. I’m not just saying, they’ve really produced some really good stuff, that’s why young and professional players moving towards New Balance Cleats. The New Balance cleats have a great design and give you a stylish look that looks perfect on your team uniform. But, along with a perfect style, they offer so much which you can’t ignore. The cleaning of cleats is always a difficult task, therefore, textile & synthetic upper is used on the upper side that provides durability and helps you to easily clean them. The really good feature is that you’ll get a toe protect in these cleats. As mentioned earlier, pitchers have a tendency to drag their toe through the dirt when they fall through the rotation. So, this reduces the life of their cleats. This toe protect will protect your cleat’s toe area from getting damaged every time you drag your toe through the dirt. It is made of special material that protects the front side of your cleat that results in an extended life of your baseball shoes. The debris-free construction along with the thick reduces the possibility of getting dirt inside your pitching shoes. The REVLite midsole gives you a lightweight ride without compromising with the underfoot cushioning & stability. The New Balance gives you the freedom of choosing the desired width in every pair of cleats which is not available in other brands. If you have wide feet or flat feet, then you’ll be looking for extra wide cleats. The New Balance offers each pair of cleats in Standard Width and Wide Width. If you check their sizing chart, you’ll see that every pair is available in ‘M’ and ‘W’ or ‘2E’ width. The ‘M’ stands for standard size, while ‘W’ or ‘2E’ or ‘EE’ stands for a wide version of the cleats. This is an extremely helpful feature that clearly tells you which size & width you’re going to get. The New Balance L3000v3 Metal Cleats are perfect for the pitchers who like metal spikes. If you take a close look at these Cleats, you’ll notice that there is an 8-Spike Configuration. These 8 spikes are strategically designed to give you the optimum grip on the field. If you take a look at the price of L3000v3 Metal Cleats, you’ll see that they offer really good features, comfort & stability. That’s why, before taking any other shoes into consideration, I highly recommend you take a look at the customer reviews of L3000v3 Metal Cleats and see yourself, how satisfied other players are. If your league doesn’t allow metal cleats or for any reason, you don’t want to buy metal cleats, then the best option you have is New Balance PL4040v4 Molded Cleats. With all the above-mentioned features, they’re lightweight as compared to the metal spikes. The price of New Balance PL4040v4 Molded Cleats is not a deal breaker for you, because they’re affordable. If you like them then before buying make sure you check the reviews of PL4040v4 Molded Cleats and then make the final call. If you play on the turf ground or just want a pair of shoes for casual practice, then try New Balance 3000v4 Turf Shoes. These are available in various different colors & designs. These are lightweight, comfortable, and available in different sizes & widths. The price is not high, and they totally worth it. Just take a look at the reviews of 3000v4 Turf Shoes, and make your own decision. If you don’t like the L3000v3 cleats, then New Balance L4040V3 Cleats is my second recommendation for the baseball pitchers. Yes, New Balance is my second recommendation, and there is a reason behind it. I love this brand because they manufacture cleats that are perfect for the pitchers. When it comes to finding the perfect cleats, then pitchers need to consider a few things first that I already shared above. Before buying any pair of shoes, a pitcher checks that whether it offers a toe protect or not because it is one of the necessary features that every baseball cleat should have. 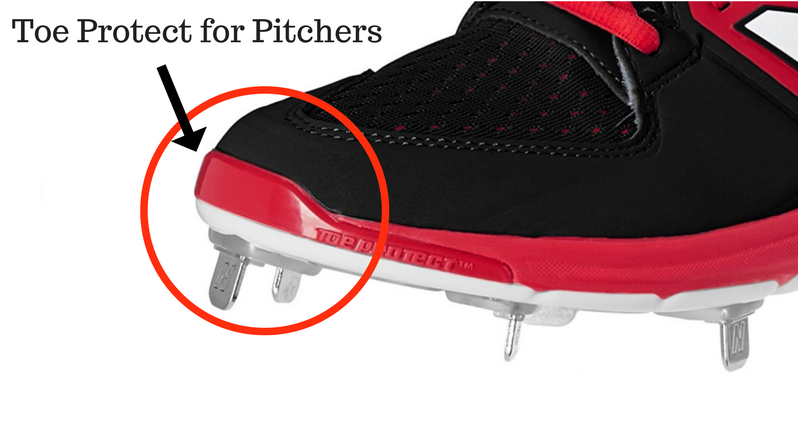 If there is no toe protect, then it’s better to choose another pair of cleats because as the pitcher drags his toe, then cleats without toe protect will start to break on the front area. But, the special feature that makes New Balance far better than other brands is that you can choose a pair of cleats in two different sizes. If you have wide feet or flat feet, then you need the wider cleats, and most of the brands only manufacture just one size. So, these are also perfect for players who have flat feet and want cleats that adjust on flat feet. Therefore, players who need wider shoes suffer and they can’t find proper fitting cleats. In that case, New Balance provides you a great custom sizing option. 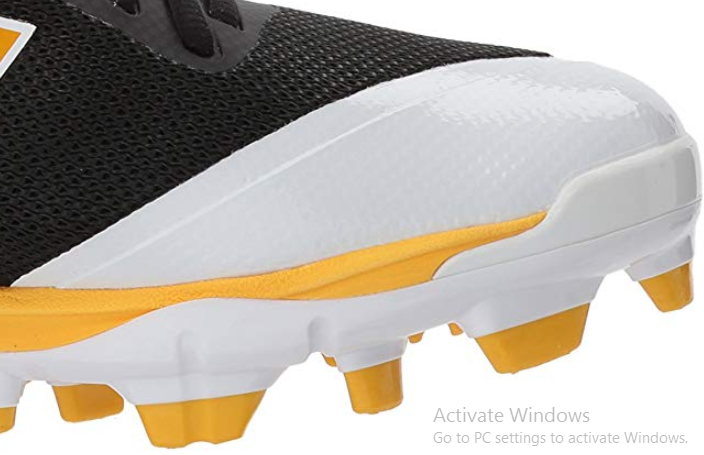 The L4040V3 Cleats are also more stylish as compared to the L3000v3, but when it comes to design, it totally depends on the player’s personal choice. There are also other great features and I can keep going with them. The Fantom Fit Upper and enhanced cushioning in the heel makes them very comfortable and easy to wear. Along being very comfortable, they’re also one of the lightest baseball cleats that you can find on the market. These synthetic cleats are long-lasting, and they’re totally worth the price you’ll pay. Just like New Balance, Mizuno is also becoming very popular because of their high-quality baseball cleats. Nowadays, young players prefer Mizuno & New Balance cleats as compared to other brands. The synthetic sole along with the 9 spike configuration gives you an excellent grip on the field and helps you to keep balanced when you pitch a baseball. If your cleats are not providing enough grip, then after pitching you’ll get imbalanced. For that, Mizuno’s 9 spikes advanced outsole provides maximum traction and grip on the ground. As a pitcher, you need forefoot protection of your cleats, and in these Mizuno shoes, they provide ProFlex forefoot construction for the extra protection of the shoes. These have metal spikes but they are non-removable. It would be good if you could remove them because that would be very helpful in the cleaning process. And, if your league doesn’t allow metal cleats, then these are not for you. In that case, the next recommendation is for you. Nike is a big brand that manufactures shoes & clothing for a variety of sports. When it comes to baseball cleats, they have manufactured some good cleats for pitchers. But, in the young baseball players, they are not as popular as New Balance and Mizuno. These Huarache cleats are made of synthetic leather. For the cushioned comfort, they have added lightweight Phylon midsole. The forefoot area of the cleats is protected that is a must for the pitchers. They have rubber spikes, so if your league doesn’t allow metal spikes, then you can go with Nike Huarache. They are comfortable, stylish, and you can select from the five different colors. If you prefer an international brand, then there is nothing better than Nike Huarache for you. These all are good options for the baseball pitchers. You can choose anyone from above these. There are also some other cleats that I did not mention here, but you can also try them. But, make sure, whatever pair of shoes you buy, they should have a toe protect so that they will last longer. If I have to select one pair, then as I told earlier, my personal choice will be New Balance Cleats. I tried my best to provide you each and every detail that should be considered before buying the pitching cleats. If you have any question, then please ask in the comment section. I’ll try my best to answer as soon as possible.